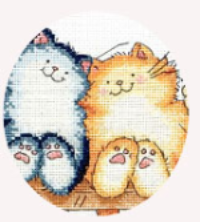 Anchor has a wide range of crafts from Counted Cross Stitch To Tapestry. They come in a variety of designs and skill level. Counted cross stitch is a stitching technique made by two stitches to form an X which is the main element within any design. This X can be used to create motifs to more complex designs.